On Saturday, we went to eat at Mikado. 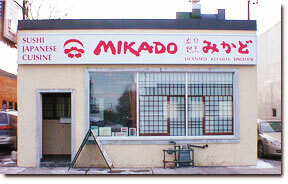 Mikado is a small Japanese restaurant located at 114 Laird Drive in Toronto. It’s south of Eglinton on Laird. There is parking in the back and street parking is also available. When you first walk in to Mikado you get the sense that it is an authentic Japanese restaurant. They greet you with “irashaimase” pronounced correctly which is in stark contrast to the mangled, garbled pronunciations you can hear at a lot of the non Japanese owned restaurants. It’s a small thing but for a person that understands the word, it’s a constant irritant to have it butchered. Why do non Japanese staff have to pretend to speak Japanese? We’re in Canada. They could just as easily say “welcome” and it would not detract from the charm. We are seated at one of the small tables for two. The first thing I notice is a man standing beside a takeout order. The only thing that took longer than getting our menus was for that poor guy to have his credit card charged. He was looking very frustrated by the time he was able to leave. As you may have already guessed, we were not overly impressed with the service. There are two waitresses for the whole place. They are friendly enough but someone really needs to light a fire under them. The overall clientele I would describe as kind of crusty and “waspy”. Which probably explains why the waitress made sure I was okay with Uni (sea urchin) and Ikura (salmon fish roe). She looked surprised when I said it was fine. We ordered gyoza, vegetable tempura, futomaki, kani croquettes, a sushi dinner and mandarin cream pie with real whipped cream for dessert. Once our order was finally taken we waited a little bit and got an appetizer. It was some gobo and some kind of cold marinated or cooked tuna in gelatine. The tuna looked like chicken and tasted like tuna. It wasn’t bad but not particularly good either. The gobo was very nice. Though when the table beside us asked the waitress what it was, she could only reply that it was a vegetable and waved them off with a flick of the wrist saying that she doesn’t know what it is in English. Now this is a bit of an irritant also. Mikado has been in business since 1978. The least the waitress, who has been there for many years, could do is look it up and tell people that it is burdock root. I’ve noticed that quite a few restaurant owners like to keep their ethnic ingredients secret sounding to maintain the allure even when they are relatively mundane things. Of course jpanesefood101.com readers get all the info right? The next thing to arrive was a salad. It had a type of vinegar and onion dressing. There used to be a restaurant in Yorkville called Zerosun that made a similar dressing but with a bit of mayonaise. It was much tastier. We both found the Mikado salad very sour. The mayo used to balance out the flavours in the Zerosun version. Next we got the gyoza and futomaki. My wife particularly liked the futomaki. They had good flavour and texture. The rice was not too sweet or dry but was full of flavour. The waitress did however refuse to give us soy sauce for them saying that you don’t use soy sauce with futomaki. They seem to be a bit militant on how you eat your food which was a bit of a turnoff. On their web page they state to not dip the rice in the soy sauce which is correct and also not. In Japan it is acceptable to do either but connoisseurs usually advocate dipping the fish in only. It’s also the method I prefer but I don’t like being told how to eat my food. Not even Japanese people agree on most of it. They need to lighten up. Though I do understand their frustration because there are a lot, and I mean a lot of bad Japanese restaurants in Toronto that are not even close to tasting like Japanese food. Anyway, the futomaki was actually good without the soy sauce because the fillings were “juicy” and flavourful enough to compensate. Especially the egg. Another reason for not using soy sauce was probably the addition of unagi. The unagi is flavoured with a sweet sauce so dipping the whole thing in soy sauce would probably have ruined that flavour. Mikado got two things right in making the Gyoza. They used pork instead of beef and the skins were nice and thin. But that’s where it stops. The gyoza needed more meat in them. They were lacking a bit of flavour. My personal preference is also a bit more garlic but I would not hold this against them. While we were eating we decided to get an order of tempura. I could see the kitchen staff from where I was sitting and I was impressed that the chef mixed a fresh batch of batter for each order of tempura that he made. Other restaurants I’ve been to treat tempura as any other deep fried dish and get the batter completely wrong. It’s important to use clean oil and fresh batter when making tempura. Mikado does both. However when we finally received it and tasted it, I found it to be a bit bland again. I’m not entirely sure what was wrong. We suspected that the oil was probably not hot enough when it was cooked because it lacked the distinctly crisp flavour and texture of tempura. It was not awful or anything but it needs a little work. Finally my sushi arrived. It cost over $30 for 16 pieces so I was a bit miffed at first but when I tasted it I was impressed. First the negative. They say that you can tell a good sushi chef by the quality of his tamagoyaki or dashimaki alone. Good tamagoyaki is light and fluffy (the Japanese have a word to describe it, “fuwa fuwa”). It has a dashi flavour which some cooks guard and a hint of sweetness. This tamagoyaki was far too sweet and dense. I didn’t particularly enjoy it at all. In my opinion, it was all wrong. It worked well in the futomaki but on it’s own, it was not good. But that’s where my criticism stops. All the other sushi were excellent! The rice was expertly flavoured and the fish was absolutely delicious. Very good quality without the bad flavour that can come when ordering whitefish at some lower quality establishments. Owner and chef Keiichi Masuda is obviously a master of his art. The tuna sushi roll was simply delicious. For dessert we had a slice of their home made mandarin pie with real whipped cream. It’s rare to get good whipped cream at any restaurant and I was surprised to find it at a Japanese restaurant. One day kids will have absolutely no idea where their food comes from or what it should taste like. They’ll think that McDonald’s cardboard fries are French fries and whipped cream must come from a spray nozzle. Needless to say, the pie was absolutely delicious. It was topped with a single raspberry and small piece of kiwi. The raspberry when eaten with the pie added a whole new flavour but completely complemented the pie. If you’re going to go to Mikado, make sure you’re not in a hurry. The service got absolutely low marks from us. If they want to hold up Japanese values and atmosphere (which they seem to want to do almost fanatically) they should acknowledge that you’d never see this poor level of service in Japan. I saw people there working for minimum wage and no tips running to get customers their orders with a smile on their face. Don’t expect that at Mikado. The speed of service and the senior waitress’ demeanour left much to be desired. The overall flavour was not bad. They seem to use fresh ingredients and take care in the preperation but in the end the taste is lacking. We find this to be a phenomenon in Toronto. The kitchen is either good or the sushi is good but rarely if ever both. I think this is because in North America we expect a “Japanese restaurant” to always have sushi no matter what. And of course tempura and the ubiquitous teriyaki. In Japan, restaurants tend to specialize. Some place will only serve tempura for example. But this is the situation here so there we have it. Finally, the sushi was absolutely excellent. If you go, go for the sushi and avoid the temptation to order any of the cooked dishes. Overall, it’s worth a trip to Mikado. You may actually taste some dishes the way they were meant to taste. Certainly the sushi will be superior. Is this article from an authentic and qualified food critic? I’m not sure what qualifies anyone as a food critic so what I can say is that the article comes from someone that has worked and cooked in a Japanese restaurant and is also a professional writer. That’s pretty qualified in my book. Mikado is the best Japanese restaurant in Toronto. Owned and operated by Japanese, it is as authentic as it comes. It can be slightly pricier than other “japanese” restaurants in toronto, but you’re paying for MUCH better quality food. IT’S DEFINITELY WORTH IT!